The Amazing benefits of Strength Training is no news. Now learn the best exercises & workout programs to Build Muscle, strength. These tips work for both men and women. Strength Training is the absolute best way to Build Muscle Mass, build incredible strength and gain confidence. I bet there is any more effective way to change your body and remain fit and strong forever than Strength Training. This Strength Training includes Strength Training Routines too. Choose your strength training routine now. How does Strength Training work? Do you need Strength Training? Strength Training Options - Get ready to be surprised! I will let you answer that question. Imagine how does your body respond to a heavy dumbbell or barbell in your hand! You body sees it as a threat to its survival. Yes a threat. Basically it does not have to be a dumbbell, or Kettlebell. It can be anything demanding your Muscles to push beyond their present limits. And how does your body respond to this challenge? Its called Fight or Flight Reaction. You either grow strong enough to handle that weight or you drop it to the ground. Now you know the incredible demands Strength Training asks of your body & mind and only YOU decide how to respond to the Fight or Flight reaction. Either you quit or you GROW. If you are still not convinced about Strength Training then read the Amazing benefits of Strength Training here. All 3 Training methods work wonderfully and have their own limitations. Which one is the best? That's not important. What is important is which one is t best for you? I suggest that if you are new to Strength Training then start with Bodyweight Exercises. Its surprising to me how many people start with Bench Press when they can hardly do 5 push ups. Your body weight is the first challenge to overcome. Please DO NOT take this advice lightly. When people ask me how they can add more weights to their Bench Press, my only answer is to build strength by doing more exercises like push ups, decline push ups and Handstand Push ups. And the results are always startling. Their bench press seems to be hitting the roof then. The same goes for Shoulder Press. Learn the best Bodyweight Exercises here. Try Isometric Exercises if you are young and open to new workouts. If you are skinny and want to Build quality Muscle mass then I suggest that you train with Dumbbells and Barbells as you can add small, incremental weights and keep adding resistance. Master the Weight Training Exercises here. Kettlebell Training is an excellent way to build raw strength, core strength and muscle mass. Learn more about these incredibly challenging Kettlebell Training method here. Do read the Weight Training for Women section as it is an eye opener for many women who think Weight Training will get me bulky and Weight Training s for men, I am better off with aerobics. Strength Training is a proven way to Build quality muscle, prevent osteoporosis and get the thin lean body you always wanted. I would suggest that you have a go at Kettlebell Training as well. Many women have found it to be a great way to build strength and lose weight. Kettlebells are becoming a strong favorite among women as they are versatile and easy to use. I would suggest 2 such Programs. Tom Venuto's Burn the Fat, Feed the Muscle. Read my reviews and Check them out. Strength Testing - Test your Strength. Check out Body, Mind and Strength for complete guide to exercise. Check out their huge exercise database. Have A Great Strength Training tip, exercise or workout? Do you have a great tip on strength training ? Share it! 1. What is strength training? Strength training is any exercise where you use resistance to get your muscles to contract. This type of training is used to build muscles. It can be done with weights, resistance bands, workout machines or your body weight. 2. Is yoga enough for strength training for women? For a beginner yoga may provide enough strength training. The idea is to push your muscles and get to the point of fatigue. After you strengthen your muscles you will need weights to get a real strength training workout. 3. Can I lose weight with just strength training? It is very difficult to lose weight with strength training alone. Muscle does help boost your metabolism, but it is difficult to build enough muscle to make you lose weight. Additionally, the actual workout doesn't burn many calories. You really need a good diet and cardio in addition to strength training to lose weight. 4. When will I see results strength training? The good news about strength training is that it doesn't take too long to get results. If you are looking for an increase in strength then you may see that in as little as one week. You will feel energy changes in two weeks and see visible results in about three. 5. How do I choose a strength training routine? A good strength training routine should target all muscle groups. If you want to do it for fat loss then you should do one to three sets with ten to twelve reps. If you want to gain muscle then do three or more sets for six to eight reps. The workout should also stress good form and work larger muscles first. 6. Any good Books on how to do strength training? There are many good strength training books on the market. A couple good ones are Starting Strength by Mark Rippetoe and Lon Kilgore and from the "for dummies" series, Weight Training for Dummies. 7. 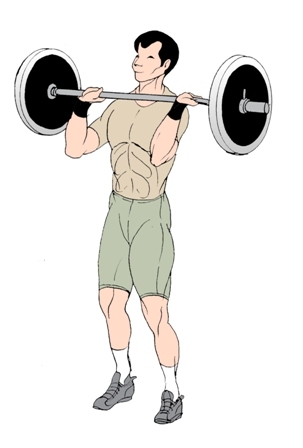 How much can a person increase his strength by weight training? The sky is really the limit. You can increase your strength however much you want. All it takes is hard work. You have to stick with it and keep increasing the intensity and weight. 8. How much weight can you gain from strength training? Weight gain is very difficult to determine. There are many factors that go into it. Your body type accounts for a lot when it comes to gaining weight. Some people may build a lot of muscle while others may not gain as much. 9. How to use strength training machines properly? Strength training machines are not too difficult to use. Just start by being calm. Make the necessary adjustments so you feel comfortable on the machine and the weight is right. Take it slow and don't drop the weights. If you do these things then you should be fine. 10. What can be accomplished in 7 weeks of strength training? You can accomplish a lot in 7 weeks. You will see results in strength, inches lost, muscles will be visible and you will feel more energized.